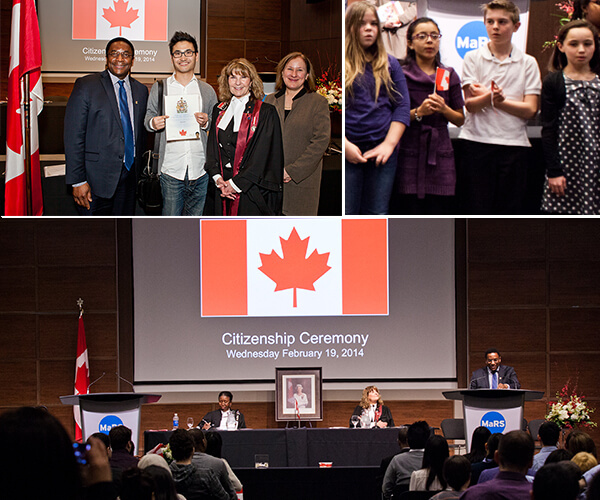 “O Canada, our home and native land” was a line sung loudly and proudly by the 56 new Canadian citizens who took part in the Canadian Citizenship Ceremony held at MaRS on February 19. With the flurry of events that take place at MaRS, you get accustomed to seeing many different types of people walking through the MaRS Centre’s front doors. You come to notice that the one thing all of these different faces have in common is a look full of wonder, interest and, at times, even hope. 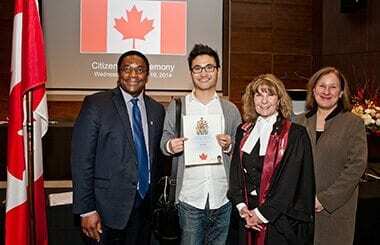 The Canadian Citizenship Ceremony that MaRS hosts annually is a great reflection of how MaRS impacts people’s lives: by offering reasons to be intrigued and to remain hopeful about Canada’s future. 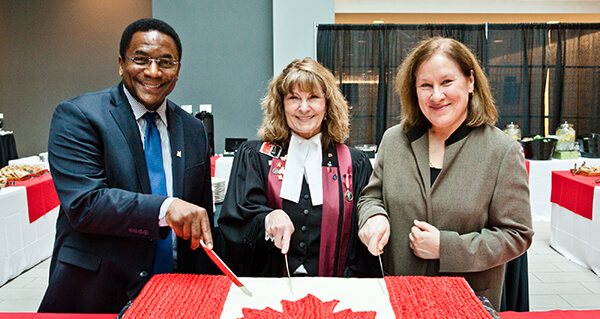 Judge Joyce Frustaglio presided over the citizenship ceremony, along with clerk Arlene Ford from Citizenship and Immigration Canada. The two were also joined by Toronto City Councillor Michael Thompson and MaRS CEO Dr. Ilse Treurnicht. 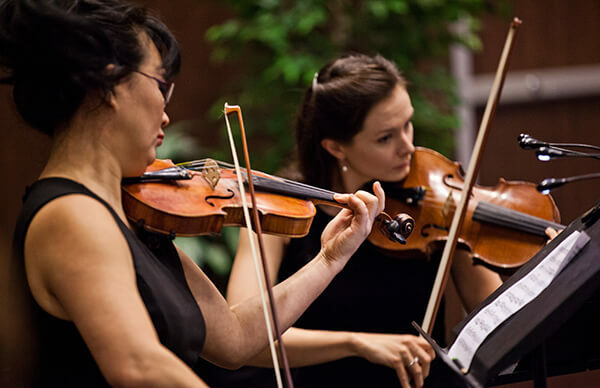 This year we were lucky enough to have a string quartet from Orchestra Toronto—which included MaRS’ very own Melissa Hughes—perform two beautiful pieces as part of the ceremony. The first number was “Allegro” from Handel’s Water Music, and the second was “The Maple Leaf Forever,” written by Alexander Muir in 1867. As a final touch to the ceremony, the national anthem was performed, accompanied by Mrs. Debby Morrissey’s Grade 5 students from Duffin’s Bay Public School in Ajax. The students are currently studying immigration and citizenship, and were eager to watch the ceremony unfold first-hand. Listening to these discussions and seeing the many teary-eyed guests made clear just how much the chance of a better life in Canada is valued. Many people agreed that they were shocked at how quickly they felt at home in a foreign land and by how open-minded Canadians are about embracing individuality. It was a time to celebrate for those citizens beginning a journey as new Canadians and a time to reflect for those of us who have grown up enjoying the freedoms of this country. I believe all of these shared sentiments resonated with everyone as Councillor Michael Thompson congratulated them after the ceremony. 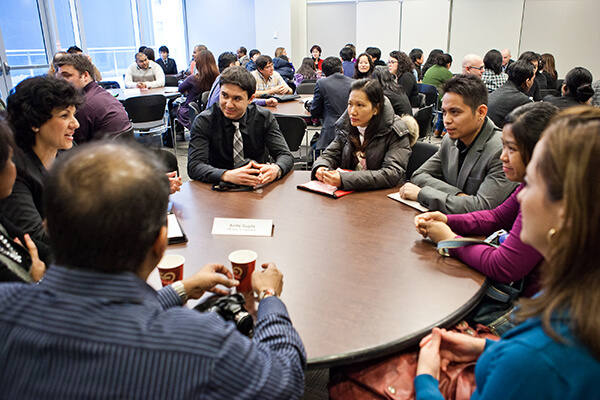 The path to Canadian citizenship embodies the mission and mandate of MaRS: to provide people with opportunities and to give way to resources and spaces that will allow them to explore their utmost potential. As with all things, there are barriers and challenges when nearing success, but I can only hope that these new citizens find a sense of home in our country while continuing to seek every open door and grasp each new opportunity.